Sorry I didn't get to put up a post last night but it got pretty late after catching dinner. We had a pretty good day yesterday (with one glaring instance of stupidity). Starting in the morning, I missed Missy Parker's Tex and Scott as they were first to the post in Nursery. This is only Tex's second time to the post ever and first in nursery and he aced it with an 83. It wasn't beat all day and he now has his first nursery leg. Dianne Page's Wynn and Scott weren't far behind and took a second place with an 80 and his second leg for the finals. We're pretty proud of Wynn and he's definitely in first hole to go with Scott to the finals as his nursery dog. Bliss managed to stay in there with a 70 and get a 5th place and her second leg. Bliss is just blowing me away with these beautiful fetches and starts her drive nicely but argues a little with Scott just as the sheep start putting pressure on her before the panels. Yesterday she took a wrong flank in front of the drive away panels and missed them. She's had less training than the other nursery dogs traveling with us so Scott isn't worried. She's qualified now so he'll just keep giving her miles for experience. Jane did much better yesterday but Scott used it as a training run and worked on opening up her flanks. 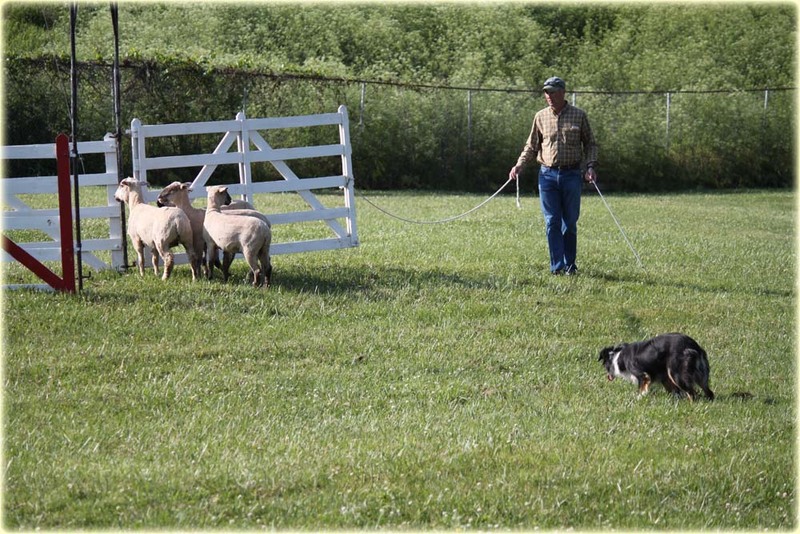 Her owner, Marianna Schreeder has been judging on the open field for 2 days and hasn't seen her dog work yet. Today she'll get to see her for the first time so Jane better pull out all the stops and impress her. Tomorrow, Marianna judges the nursery but not the pro novice, so Jane won't be able to run in the nursery. She'll do the pro novice instead. Nan looked beautiful in Open Ranch and other than a missed panel, could have won it. I believe she ended up in 5th. Hemp was the absolute worst yesterday. He had a good outrun, a good lift and THEN left his sheep to go back and sniff the set out dog. When he came back to his sheep, he then proceeded to run the sheep down the fetch as would be expected from a dog stupid enough to go sniff the set out dog. I'm not even that disappointed and I have to say that I really am not that surprised except to say that I would have thought it would have happened sooner. Hemp really fancies himself a Casanova and since I don't consider him good enough for breeding, I have toyed with neutering him. 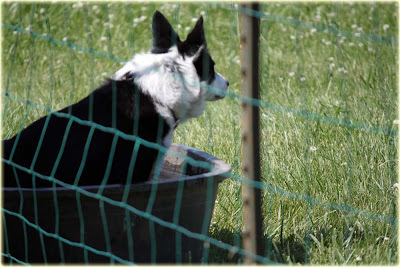 He just made that decision for me so we might see a completely different, settled, dog during next year's trial season. (I hope). Heading down the drive line, he was still acting up and after the sheep tried to get back up the hill to my post, I retired the run. I wouldn't mind getting some more points on him and running him in the finals this year (post neuter). He's got over 6 now so hopefully, he'll settle down for his Saturday run and do something good. The highlight of the day was Scott and Donnie's run. Scott told me specifically not to brag about it but (shhh) it really was a good one with lots of clever moves from him and Donnie. So that being said, I'll play it low key from here on out. It started with some horrible sheep. They just would not go to the set out post. They ran up and down the tarp line in front of the set out and tried to jump back in. At one point, we all thought it was time to quit and get another set but they finally got them (It must have taken close to 10 minutes to set them) and Scott sent Don. When he got behind them, they came running as if they had a fire behind them. Donnie opened up his flanks and stayed back, trying to settle them and they stayed on line and made the fetch panels but never slowed until Don caught them directly behind the post. Scott stopped Donnie then and the sheep stopped and they all sat there for what seemed forever. Literally, I was getting nervous that they were eating up too much time but Scott just continued to wait and give the sheep time to settle. Finally, they started to move along the right hand drive line. I'm sure their pause made some sort of a difference, but not much and Donnie had to work hard to get the drive away panels but had a great turn on to the crossdrive. 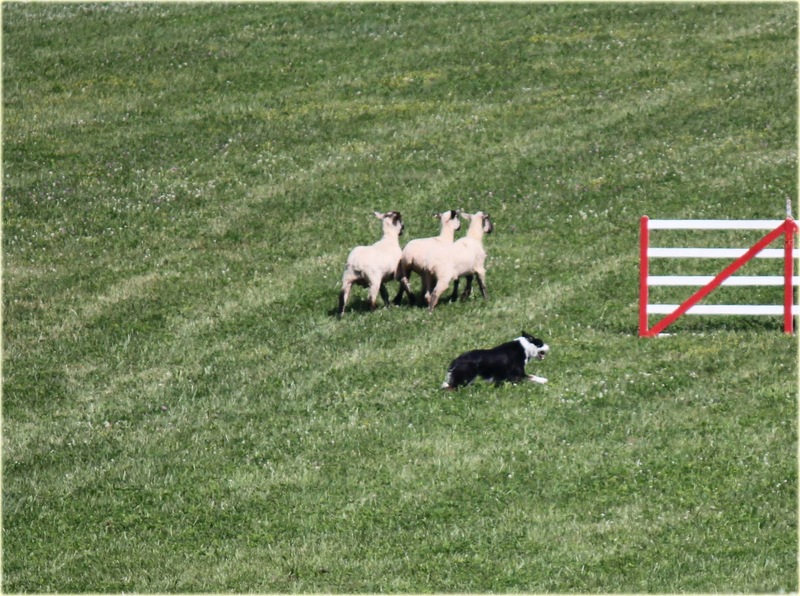 As they neared the crossdrive panels, the sheep slipped past them just low and Don caught them on the low side. The problem now was that Don was on the wrong side to make the turn without either losing his sheep to the exhaust or crossing his course. Scott fixed the problem by bringing them back in front of the panels and making them on his second attempt. This is risky because it's bad enough to miss them the first time, but if you miss them a second time you lose even more points, however it was needed to allow Don to be in the correct position to make the turn. They did it and were on to the shed. I think both Scott and I were worried about this with Don's recent history of not coming in on the shed, but he rose to the occasion and came in and held a crazy one. Then they had to quietly put them back together because she was contemplating diving into the spectators. Then Don needed a break in the water. It was pretty warm and he'd been running hard and coming down from Canada, he wasn't used to the heat yet. When he was ready, they had less than a minute to get their pen and closed the door with 12 seconds left to win the day with an 83. Today we have another day of nursery, pro novice and Lad and Don run in the open. BTW, Laddie was 16th overall for the first round with 122 dogs and got 11 points towards the finals! GREAT news on all fronts! Thanks Jenny. Sending you both all positive thoughts and wishes for a great Bluegrass.